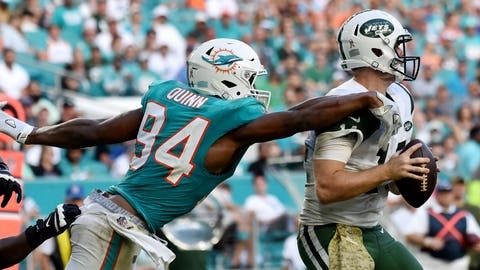 The Cowboys have agreed to acquire defensive end Robert Quinn from the Miami Dolphins for a sixth-round draft pick in a trade to bolster the Dallas pass rush while the club works on a long-term contract for DeMarcus Lawrence. The deal announced Thursday also gives the Cowboys another option while they wait to see if Randy Gregory will play in 2019 after his fourth substance-abuse suspension. Gregory is suspended indefinitely, but the Cowboys are hopeful he can be reinstated before the season. The trade is Miami’s latest effort to reduce payroll in a youth movement under new coach Brian Flores. The 28-year-old Quinn had a base salary of $11.8 million with Miami this year, the last season of a $57 million, four-year deal he signed while still with the Rams. The Cowboys have put the franchise tag on Lawrence for the second straight year. The 26-year-old hasn’t signed the offer, worth $20.5 million, after doing so almost immediately a year ago. Quinn, 28, started every game last year and had 6 1/2 sacks to increase his career total to 69 in eight NFL seasons. In his only season with Miami, he was part of a defense that ranked 29th and allowed a franchise-record 6,257 yards. He had a career high 19 sacks in 2013, when he was an All-Pro with the Rams. Quinn is the third veteran defensive end to leave the Dolphins since the season ended. Cameron Wake signed with the Titans and Andre Branch was released. Lawrence played under a $17.1 million tag last season, earning his second straight season of double-digit sacks with 10½ after finishing tied for second in the NFL with 14 1/2 in 2017. Not long after another Pro Bowl season in 2018, Lawrence took to Twitter to indicate he’s now looking for a long-term deal. If he doesn’t sign the one-year tender under the franchise tag, Lawrence can skip offseason workouts without being fined. The Cowboys and Lawrence have until July 15 to work out a long-term deal, but there haven’t been any indications that the sides are close. Executive vice president Stephen Jones said at league meetings this week that talks were at an impasse.